The Experience: 2014 has been an unusual year – the summer has been cooler than usual, and we had the benefit of that cool summer on this normally hot ride. Ron, Rita and I got started as early as we could. Even though the day started cool and the temperature didn’t get into the 90’s, we paid attention to hydration, knowing that the heat was the challenge on this ride in any case. When the sun is out, the pavement can be the sun’s anvil. You feel the sun above and the reflected heat from the pavement. This time the cloud cover and cooler temperatures helped us. 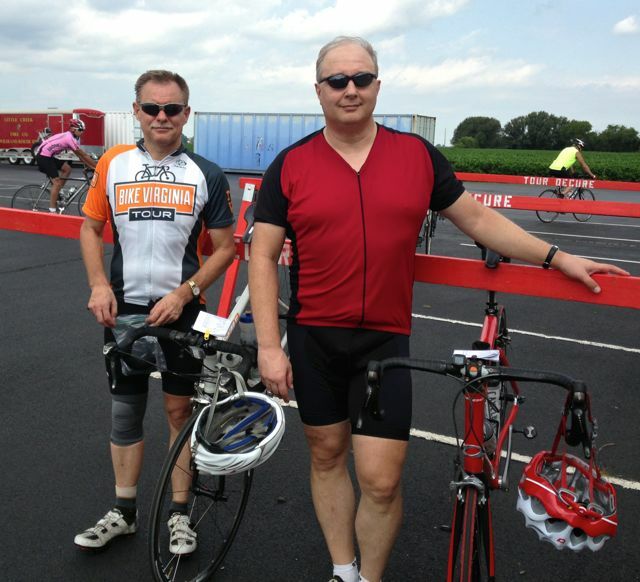 We set out at an easy pace to start, and as we warmed up we found a good pace and held on to it, riding about 18-19 mph. The roads weren’t busy except for those around Dover and Middleton, and we moved through the landscape with a quiet efficiency. Keeping a steady pace and sharing pulls at the front of the line was a good strategy. We didn’t get carried away with sprints or uneven efforts, and that consistency kept us comfortable. A fast ride pace, particularly if you get caught up in the moment and jump into a line of riders moving faster than your normal training pace, can leave you exhausted by the end of the ride. We weren’t racing, we were just holding our pace, and we had a strong ride from start to finish. We saw military cargo planes around Dover Air Force Base, and the little towns and fields and rivers and marshes slid by gracefully. The rest stops were well stocked with fruit – oranges, bananas and watermelon, as well as salty snacks – on a hot ride these things are important, and we took advantage. Selections from my mental iPod during the ride: “Jessica” by The Allman Brothers Band, “Strange Attraction” by The Cure, and “Fall at Your Feet” by Crowded House. Stats: 101.79 Miles ridden. The pace was consistent, and we ticked off the miles with our legs tapping out the beat like a metronome. 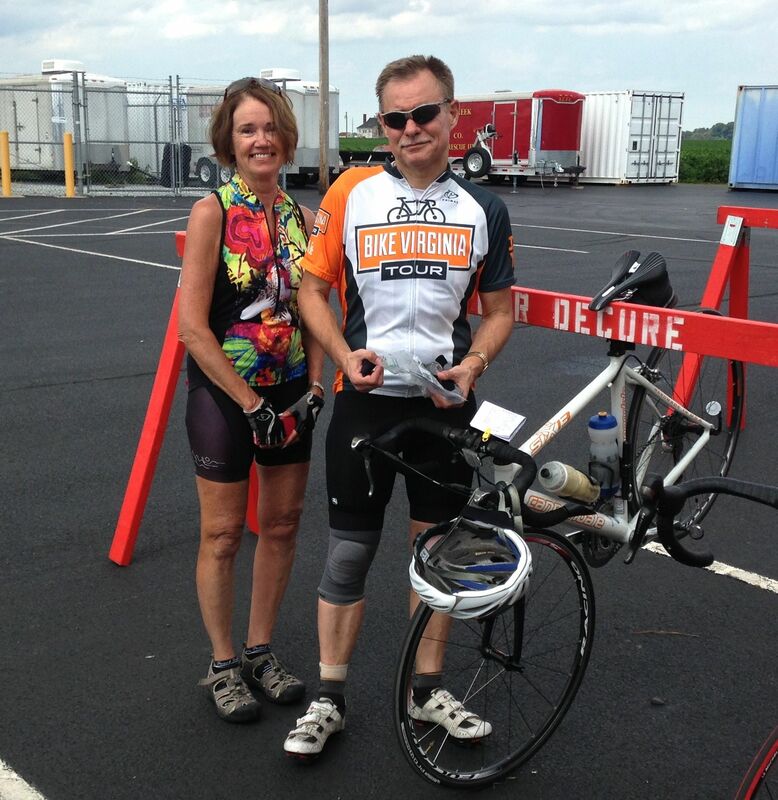 My teammates on this ride – Rita Bell and Ron Tripp. Ron & I. This was taken at the third rest stop, in Dover DE. 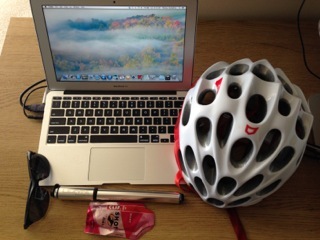 This entry was posted in Cycling on August 17, 2014 by kitefencer. Nicely done Tom. Sounds like a picture perfect day similar to our Ride to See. You and Pirate Ron and Rita and the Crab Deck? Not this time, Tony! It was a great day though.